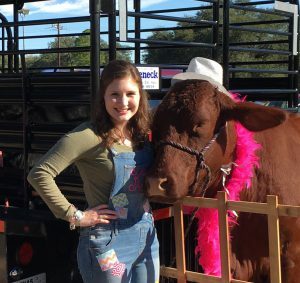 Katherine Fazzino is a senior at Rudder High School and was one of ten from the state of Texas chosen as a Texas FFA Ford Leadership Scholar. The goal of a Ford Scholar is to return to their community and develop and implement a sustainable service project that meets the needs of the community. After looking at the needs of the community, she decided to focus on the language arts/reading educational gap in the elementary schools. She decided to write and illustrate a children’s storybook that she could donate to the school libraries. The intent of Katherine’s project, Reenie’s Ranch Adventure, was to combine the creation of a children’s storybook, an author’s visit, and “real-life” representation of the characters for the purpose of enhancing learning in youth, while bridging the gap in the educational areas of reading, math, and writing, through the foundation of agriculture. With this project opportunity, Katherine is able to travel to schools as Reenie’s Ranch Adventure where Katherine and her show heifer Reenie (who is also her best friend) share their storybook, allow the students to pet Reenie, and donate signed copies of the book to the school library, participating grade level, and inviting teacher or administrator. Katherine will be appearing without Reenie at Mounce Library’s Meet the Author Day program.